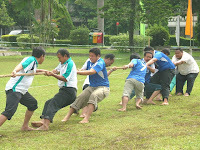 Tug of war is a game involving two teams with race, with five or more participants. Two competing teams of two opposite sides, and all participants gripped a rope. In the middle there is a limiting form of the line. Each team trying to pull a rope as hard as possible for the opposing team over the line delimiter. The team attracted over boundary lines declared lost. Tactics of the game lies in the placement of players, tensile strength and defense on the ground footstool. In general, the player with the greatest strength was placed at the end of the rope, to hold the rope at last, or stomping on the withdrawal.